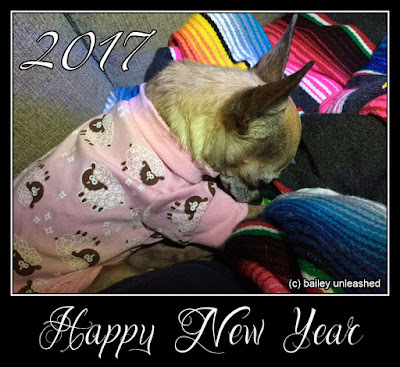 bailey unleashed .com: HAPPY 2017!!! Happy Happy 2017 to you too! Wishing you a wonderful 2017 filled with good health, happiness, and peace! Oh gurl, I knows just how you feel! too many margaritas last night, huh????? Nothin' like the 'hair of the dog' to feel right as rain! BOL!!!! I hopes you and your pack have a most FABulous New Years!!!! Very sweet pic Bailey. Happy 2017 to you.